Caving in Belize has exploded in popularity in recent years, but among the small world of cave explorers the country has been world-renowned for decades. The Maya Mountains uplifted a large area of limestone beds that have subsequently eroded into a huge network of Belize caves, many with rivers coursing through them. 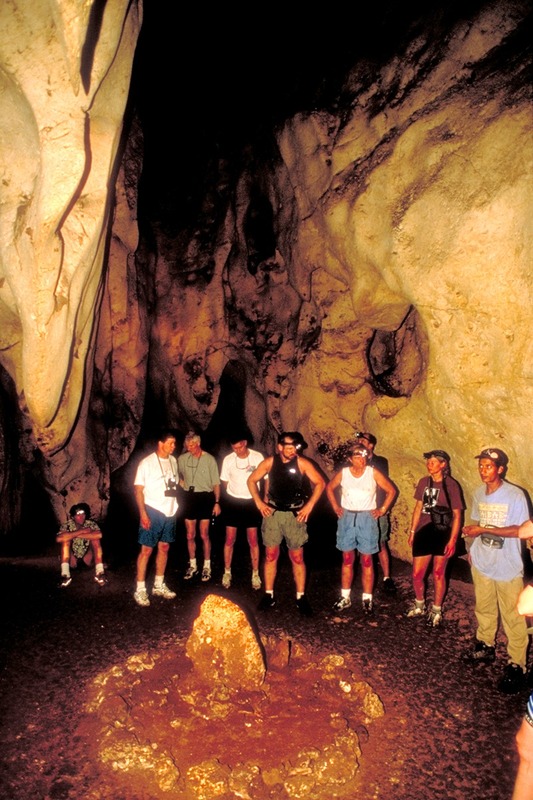 Belize hiking and caving exploratory excursions in the 1970’s and 80’s discovered the second largest underground room in the world in the Chiquibul system in the western part of the mountains, putting Belize on the map for extraordinary caves. Much of Belize’s inland topography is composed of ‘karst’ geology, which features deeply eroded limestone mountains. 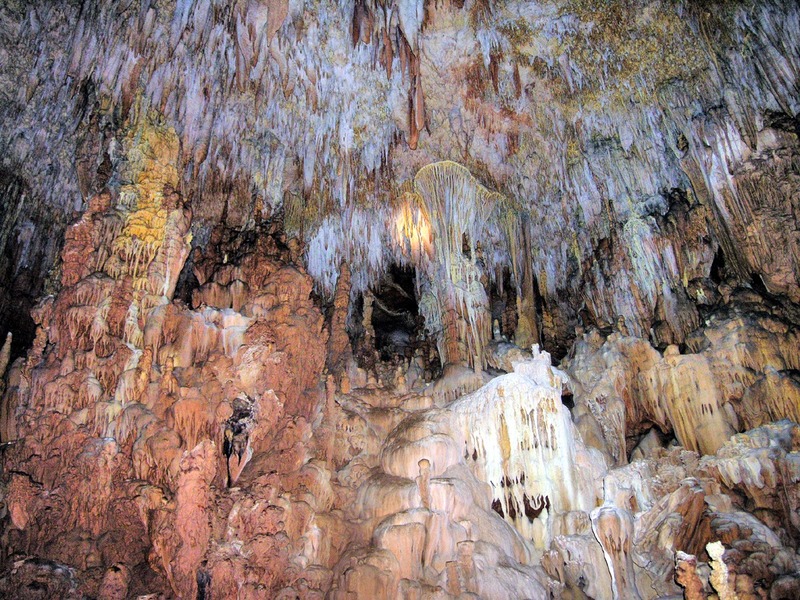 Karst geography is typically honeycombed with caves. Belize is famous among cave explorers, who have mapped innumerable underground caverns throughout the country. 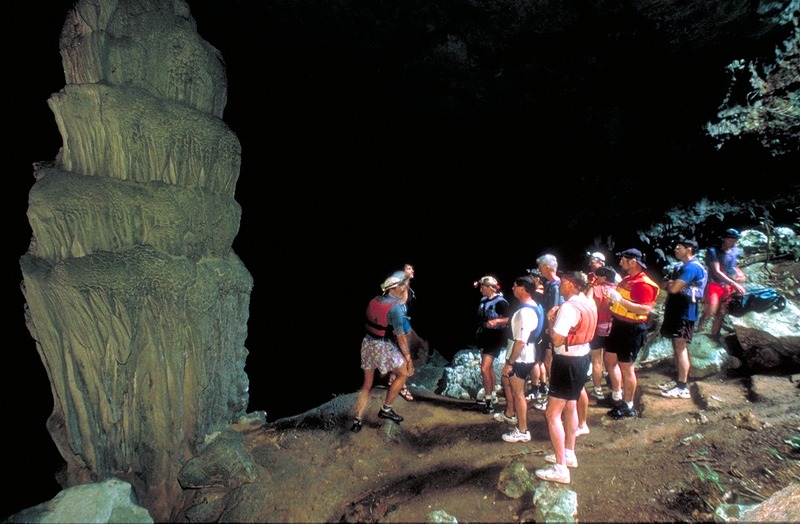 Belize contains the second largest underground chamber in the world, over 1/4 mile long! Mayan religious beliefs state that most of their important deities resided in the underworld, for which caves were the gateway. Therefore, the Mayans held all caves sacred, and performed religious ceremonies in nearly every cave they found. 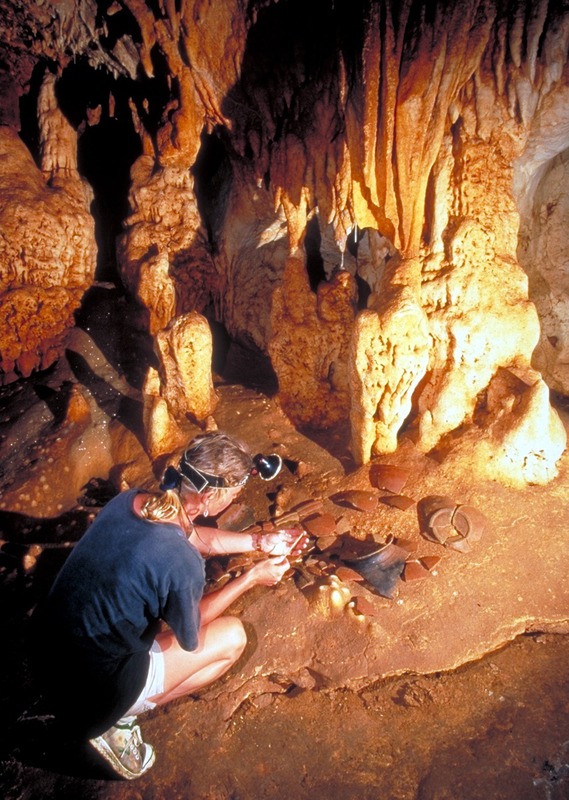 Each Belize cave contains treasures from these ancient ceremonies. 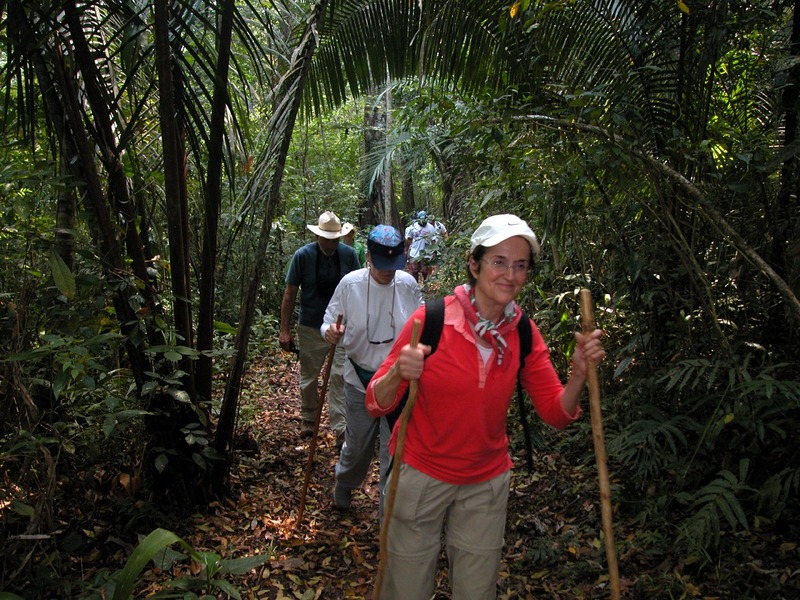 The thick rainforest cloaking the geology of Belize makes it difficult to find undiscovered openings, and new discoveries are made every year. Slickrock Adventures offers a Che Chem Ha one-day tour for groups of 8 minimum, with a maximum of 14; read more about that below. 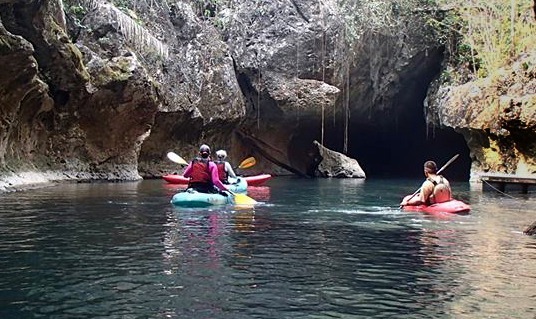 We also offer a one-day Belize cave kayaking adventure, please inquire. Many of the large caves in Belize are well known and easily accessible, but most are hidden in the jungle and hard to access and indeed difficult to even locate. Many of these caverns were important Mayan ceremonial sites, as the Maya believed that caves were the access to the underworld, home to many of their important deities. As such, these caves often contain ancient offerings left behind during spiritual ceremonies in the form of pottery, incense, carvings, and even skeletons of sacrificial victims. The Mayans held caves especially sacred as the portal to the Underworld, where many important deities lived. The underworld was known as Shivalva (Shee-BALL-ba); the gods of death resided here. Only the most intrepid and religious officials (shamans) entered caves, to conduct religious offerings and ceremonies. Lit only by torches (with no way to re-light), the Mayans would sometimes travel several miles into caves. 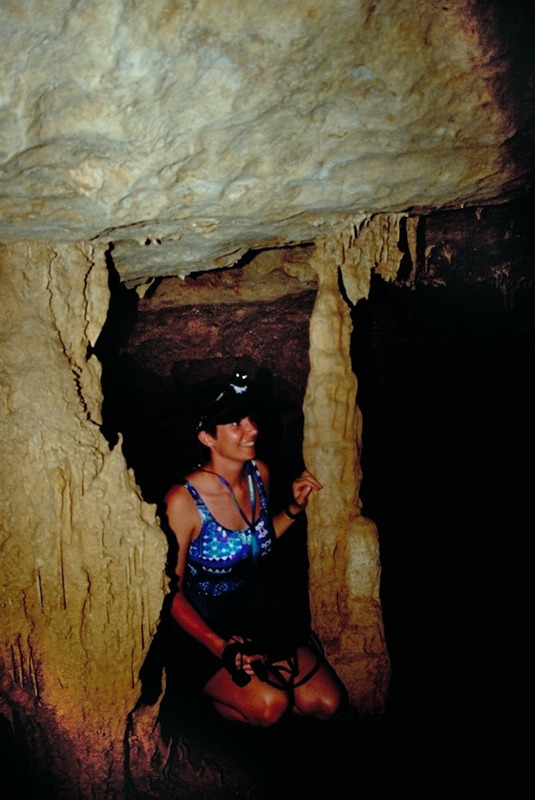 It is rare to find such undisturbed, un-looted caves such as those seen in Belize. Caves such as Actun Tunichil Muknal, Barton Creek Cave, and Footprint Cave contain a wonderland of incredible dripstone formations such as drip curtains, soda straws, travertine flows, columns, and crystalline coated fountains, as well as Mayan artifacts. The ATM Cave has become extremely famous as the premier Belize cave, having been featured in numerous articles and on television shows. Tours are allowed, guided by permitted guides only. The cave is located deep in the jungle near the village of Teakettle Bank. You access the cave by swimming into the creek that flows from the cave’s entrance. Inside the cave lies an amazing collection of ceramic pottery and ceremonial sites, along with huge dripstone formations. 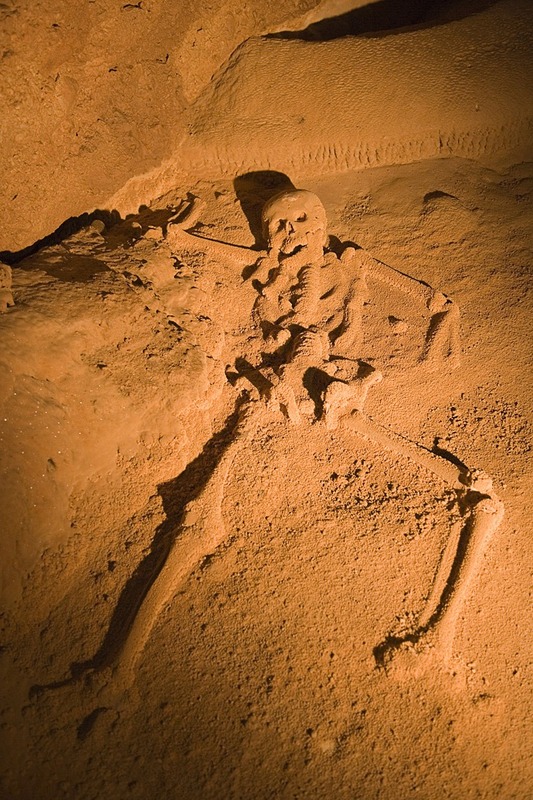 The main feature is a complete skeleton of a young woman which has been encrusted with calcite crystals and bonded to the floor of the cave, know as the Crystal Maiden. If you plan to visit, you may not go without a guide. 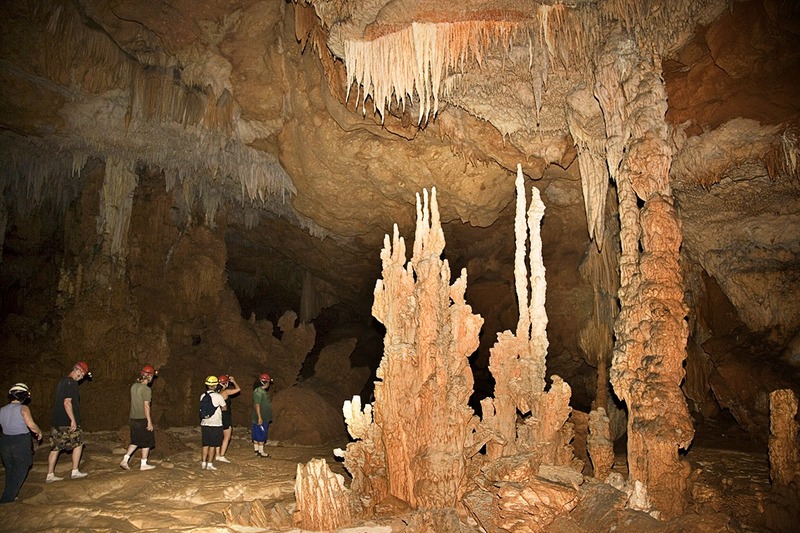 Visit our Belize Things to Do – Go Caving page to locate a great guide service while staying right next door! This cave was discovered in the 1980’s by a local farmer searching for palm leaf. His dog chased some game into what appeared to be a burrow. When the dog did not come back out the hunter investigated and found that the opening was a rock filled entrance to a cave. 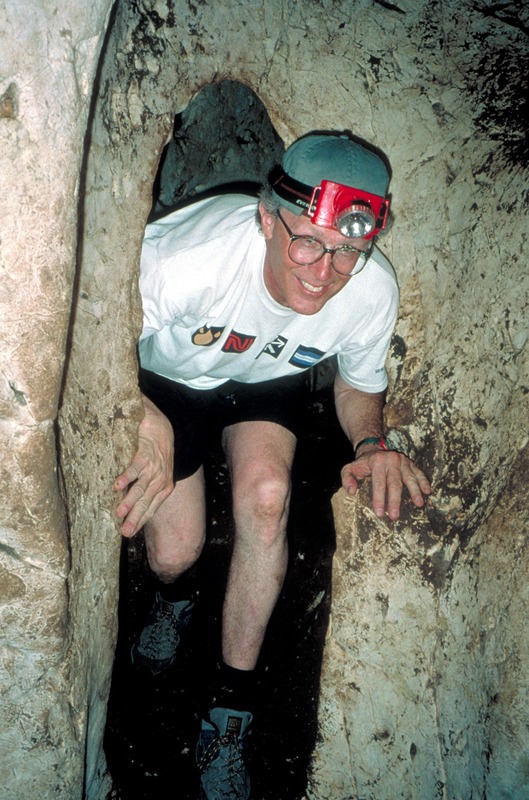 Since he lived nearby, he came back to investigate further and found a huge cave filled with Mayan ceremonial pottery and a deep ceremonial chamber that extends one-half mile into the earth. 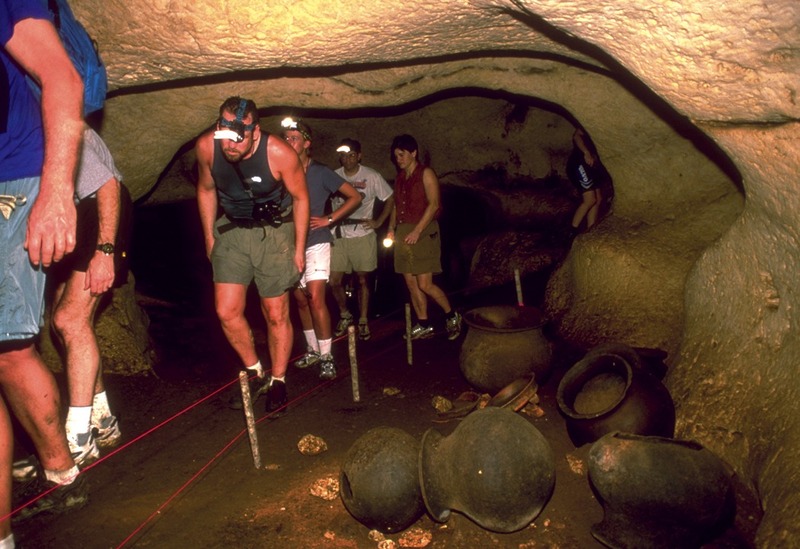 He soon started tours of the cave with the Belize Archaeological Department’s blessing, since it is located on his property. Today one can take a tour with William, the farmer who originally found the site, and see hundreds of offerings the Mayan shamans left after completing their ceremonies. The Yucatan peninsula is a huge limestone block. Where this block borders the Maya Mountains, uplifting and folding has occurred, exposing multiple cave systems. 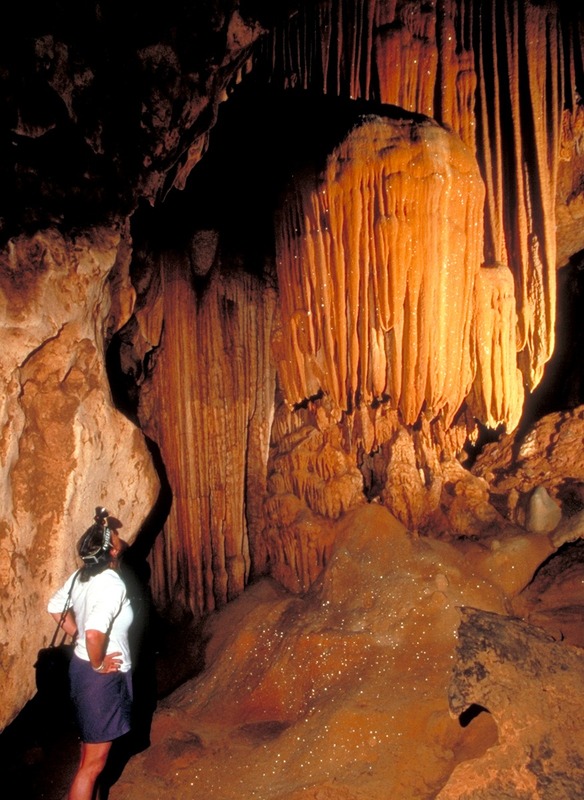 A cave in southern Belize contains the second largest underground room in the world, over 1 km. long and hundreds of feet high, and when discovered in the 1980’s it was the largest room yet found. A cave in Indonesia currently holds the world record. Limestone is a rock composed of remains of marine life (shells), and the precipitates of calcium carbonate that collect on the floor of tropical seas. Coral is also a big contributor to limestone formation. When limestone is uplifted or shifted due to geologic processes, it often becomes part of a continent and thus is exposed to groundwater movement. This water then is able to dissolve the limestone beds into cave formations. Water dissolves limestone by slowly chemically bonding with calcium carbonate, which is then carried away in suspension with the groundwater. Regular erosion due to the surface water movement (rivers and rain) also occurs. Rainwater percolating down through limestone encounters organic debris on the surface, and picks up CO2 as part of the process, forming week carbonic acid, which also slowly dissolves calcium carbonate. When the acidic rainwater meets the calcium carbonate laden groundwater, a chemical imbalance occurs which causes the water to rapidly dissolve more limestone, up to 25 times more than it could otherwise. This reaction is what causes such extensive “solution erosion” to occur, which forms the huge underground caverns found in cave systems. This process is most active in tropical, rainy regions like Belize. Just the opposite action occurs when a cave is uplifted (or groundwater drops) and exposed to air. When percolating acidic groundwater that has already dissolved some limestone hits the air, another chemical imbalance occurs and limestone is then rapidly deposited (precipitated out of solution) in the cave as “dripstone” formations. These are the stalactites, columns, curtains, and other “flow stone” formations found in caves. Cave systems often form along waterways that groundwater follows (fissures and faults in the limestone), enlarging the cavities into long caves. Rivers are often found in such caves, as in the Caves Branch River in Belize. The Caves Branch is an “active” cave, eroding through both solution and mechanical means. It also has precipitation formation occuring. Karst regions in the tropics form “cockpit karst” topography, where many sinkholes develop and gradually lower the surface into a very rough, pock-marked terrain that is literally “peppered “ with cave entrances. This is the topography encountered on the Caves Branch River. Cost: $195 US pp, includes pick up and drop off in Belize City and lunch. This all inclusive Belize trip also includes a stop off at the internationally famous Belize Zoo. No group discounts available.